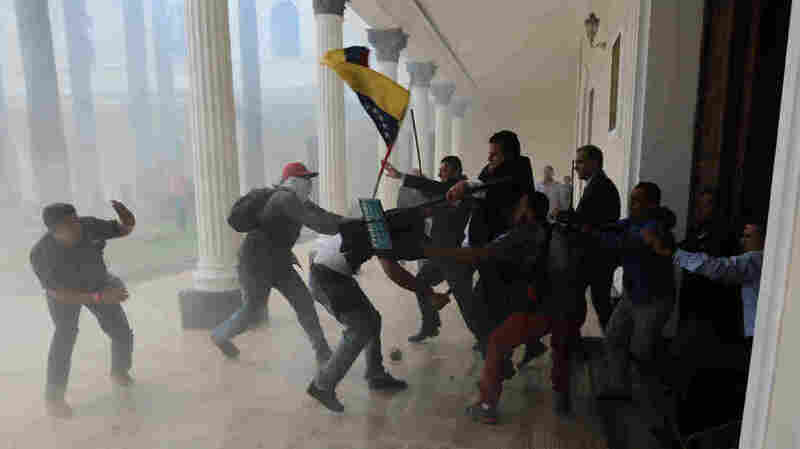 Violence Breaks Out At Venezuela's National Assembly : The Two-Way Pro-Maduro groups stormed the building and attacked opposition lawmakers, as the political crisis deepens. The vice president reportedly had urged the president's supporters to come and show support. Opposition lawmakers brawl with pro-government militias trying to force their way into the National Assembly in Caracas on Wednesday. 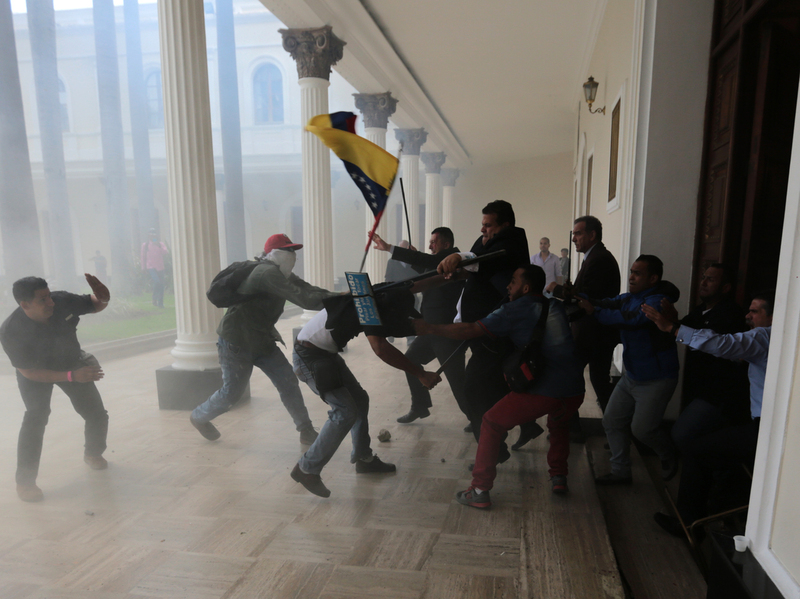 Pro-government groups launched an attack on Venezuela's National Assembly in Caracas on Wednesday, beating opposition lawmakers with sticks and metal batons, reports The Associated Press and other media outlets. Small explosions — possibly from fireworks — could be heard throughout the building, says Reuters. Reporter John Otis tells NPR at least three lawmakers and two legislative aides were hospitalized. Photographs taken at the scene showed bloodied protesters and lawmakers clashing with sticks and even the national flag as smoke fills the air. 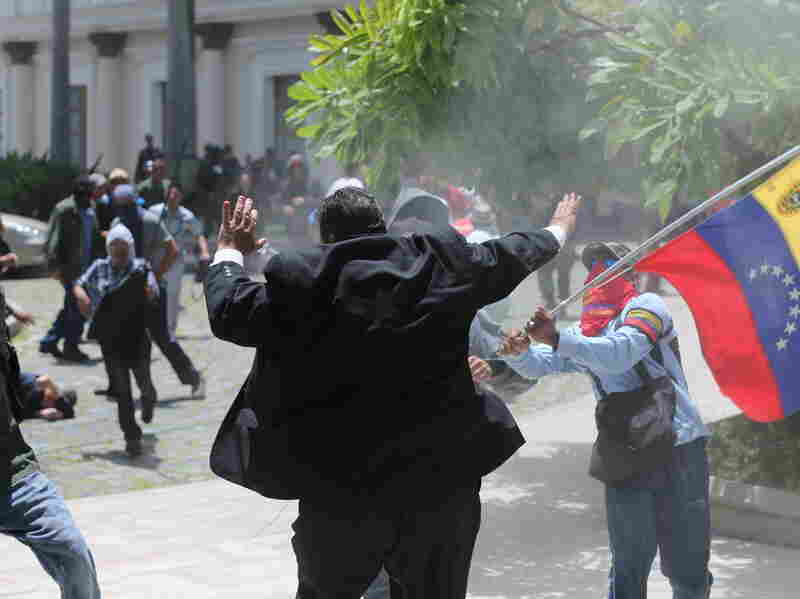 Masked men confront opposition lawmaker Franco Casella during an attack on Venezuela's National Assembly on Wednesday. The BBC reports the violence unfolded after a crowd had been rallying outside the building for hours. AP video reveals dozens of protesters marching down a highway chanting and throwing objects. Just before the attack, Vice President Tareck El Aissami made an unannounced visit to the legislature and urged the president's supporters to come and show their support, says the BBC. Venezuela was celebrating its independence day on Wednesday and President Nicolás Maduro was giving a speech at a parade in another part of town during the melee, according to the BBC. One of the injured lawmakers spoke to the AP from inside an ambulance while being treated for head wounds. "This doesn't hurt as much as watching how every day how we lose a little bit more of our country," Armando Arias said. Venezuela is in the midst of an economic crisis, resulting in severe shortages of food and medicine. But it is also going through a political crisis, with the legislature accusing the president of running a dictatorship and plotting a coup. Often-violent anti-government protests have been roiling the country for months. Last week a police helicopter was used to fire shots and drop grenades at the country's Supreme Court and Interior Ministry. "I will never be an accomplice to acts of violence," said Maduro during a speech at a military parade on Wednesday, reports AP. But he also said the opposition doesn't do enough to control "terrorist attacks" against security forces by anti-government protesters. The State Department said the U.S. condemns the attack as an "assault on the democratic principles cherished by the men and women who struggled for Venezuela's independence 206 years ago today." "We call on the Venezuelan government to immediately provide for the protection of the National Assembly, ensure those injured in today's attack are able to receive medical attention, and bring the attackers to justice. We urge all sides in Venezuela to refrain from violence." The statement also criticized "the Venezuelan government's increasing authoritarianism," and called for free elections and the release of political prisoners.